Watch as Davison’s Better Way to Invent turns Gary and Ruth’s Twister Bolts idea into a store-ready reality! Eastern Pennsylvania couple Gary and Ruth Frazer came up with their home improvement product idea in the same place that many people do a lot of their thinking… the bathroom. Ruth got tired of loose toilet bolt caps falling off after cleaning or getting carried away by family pets and toddlers. Along with her husband, Gary, she wanted to find a way to secure loose caps to the bolts, for a better-looking, safer bathroom. Something in Gary and Ruth Frazer’s bathroom really stunk… the existing caps covering the bolts that secured the toilet to the floor were always either loose or broken. Not only was the problem annoying, Gary and Ruth wanted to protect family pets and toddlers from the potential dangers the loose caps could create. The eastern Pennsylvania couple patented their idea for toilet bolt covers and brought it to Davison. 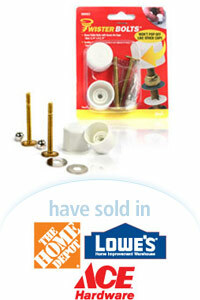 Now, Gary and Ruth’s Twister Caps and Twister Bolts have sold at Lowe’s, Home Depot and several other major retailers.